This Blog is not deep. It’s not that I’m shallow or never think deep thoughts or wrestle with complex issues. But, I have passed the time of enjoying theological battles. I want to encourage people to live better lives for Christ’s sake. We cannot reach the world by proving that this pastor is shallow or that one is a fraud. Allow God to deal with his own servants. He is able to lift them up or take them out. I’m a simple man. I think most Christians are simple people (theologically). They don’t need to be able to argue transubstantiation; they want to know how to raise their kids or keep their marriages together. They’d like to be better people and if ministered into it, they will become better followers of Christ. They are capable of learning new and deeper things and of maturing in their walk with God. I’ve listened and read a lot of the “deep guys” bad mouth and talk down the ministries of some prominent Christian pastors because they are preaching a simplistic feel good gospel that doesn’t call people to the deep things of God. They criticize them for not presenting the full demands of the Gospel. They write off these purveyors of the “shallow gospel” of pop psychology and feel good religion as almost apostates (that means one who abandons their faith). This way of judgment is wrong. I encourage you to read the book, A Simple Path by Mother Teresa. It’s real and practical and while you’re not looking, it gets you deep into the real call of God to participate in a Gospel that is about ministry to real people, and a love for God and Jesus Christ. The Gospel has always been about God’s desire to save man through the message of Jesus. His message was to love God and love others. The legalists and judgmental don’t know this message. They talk of grace while citing law and fuming judgment. I have on my bulletin board a bumper sticker that is white with black letters. It says, “Generic Christian.” I’ve had it for years. It reminds me that we are not about anything but that which is Christ centered. So pardon me if these articles don’t get too deep. I write each week to encourage who ever might stop by to think nobler thoughts and to live in such a way as to make a difference in the world, for Christ sake. If you need to be yelled at or beaten down, I can send you some sites that will do that. In the mean time, I will continue to encourage through the simple message of the love of God in Christ Jesus. Yes, I'll concede that the Christian walk is simple, but it is at the same time intensely difficult and marvelously profound because God is intensely difficult and marvelously profound. Dumbing down God is not the answer. God seeks to nurture us wherever we are, whether in the trenches or in the ivory towers. And in the difficult times we'll most certainly face, the feel-good plattitudes and catchy sayings just don't get it done. I think we need to know that there is more to it; we need to know that there is deepness. Even if we don't have the capacity to go there--His thoughts are higher than our thoughts, after all, Is. 55:8-9---there is comfort to be found in the very fact that God is profound. It helps us to know that there's One who has things all figured out even when we don't. We should be okay with deepness even if we can't approach it. The ministry of mindful study is every bit as viable as the ministry of benevolence, but no matter at what level you engage God, whether elementary or erudite, one's theology is not the end but the means to knowing how and why to serve. God's deepness makes us aware of our shallowness, which in turn should humble us, which in turn should make us want to serve. James says you'd better live it out or your faith is, pardon the pun, simply worthless. Once you get to the point where you think you've got God all sauced out, beware, for complacency lurks nearby. You'll either become bored or cynical. Neither has a place in the life of a truth seeker who is in active pursuit. michael, here is something simple to think about: a pencil is simple compared to a typewriter, but you can do more with a typewriter. a typewriter is simple compared to a computer, but you can do so much more with a computer. don't believe me? try blogging about "the simplicity of the gospel" using a pencil or typewriter. my point is that sometimes "simple" things are more "complex" than they appear. the gospel is not simple, it is profound and complex. (read romans lately?) the beauty is that you can do so much more with complex things. notice i said complex, not complicated. 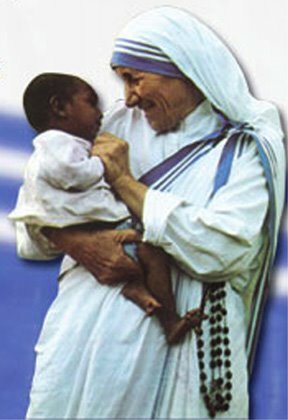 as for mother theresa, no one denies her great humanitarian achievements. but we should not confuse humanitarian work with the gospel of Jesus Christ. not every form of critique should be construed as judgmentalism. i simply refer back to your post where you take a swipe at the "deep guys" for drawing lines of distinction between truth and error. BTW, insightful comments sir duncan.